QUEENS — On Tuesday, 59-year-old Ditmars resident Wendy Rodriguez crossed the street with the help of a crossing guard outside of P.S. 2 on 21st Avenue. The two began chatting, and the guard asked Rodriguez, a school administrator, if she had received a letter earlier this year from the Board of Elections, explaining that the polling site at the school would be closed for November's election. The crossing guard explained that voting would now be done about a mile away, at P.S. 84, on 41st Street near 23rd Avenue. "That's ridiculous," said Rodriguez, who lives in the neighborhood. "You know what's going to happen? People aren't going to vote." Rodriguez's situation has become a familiar one. With redistricting after the 2010 census, concerns have risen across the city that new districts formed earlier this year would cause mass confusion on Election Day in November. But P.S. 2 faces a somewhat different problem. After being used as a polling site for decades, the Board of Elections disqualified it earlier this year it because it doesn't comply with Americans with Disabilities Act standards, local elected officials said. Adding to the confusion is the fact that the school is actually equipped with a wheelchair-accessible ramp, though it's located at a rear entrance to the school within a fence that is locked during off hours. And now those who should benefit most from the school's ADA compliance will be the ones who are most inconvenienced, Assemblywoman Aravella Simotas said. "It's inevitable that some people who traveled to P.S. 2 will not have the means to travel to P.S. 84," said the assemblywoman, whose district covers northwest Queens. In a letter to the BOE signed by Simotas and State Sen. Jose Peralta, who represents Jackson Heights and East Elmhurst, the pols detailed problems they say now face their constituency. Pols said that they have received numerous complaints about the move and have asked for additional personnel at P.S. 2 to redirect voters to the new location. "We fear that many constituents are unaware of the polling site closure and will go to the wrong site," the letter reads. "We are concerned that the confusion and inconvenience of finding their polling site closed with no one to tell them where to go will discourage voters from exercising their constitutional rights, particularly among the elderly and disabled." The BOE has yet to respond to the letter, and calls and emails to the board about polling station accessibility were not returned. In response to an August letter written by Peralta and Assemblyman Francisco Moya, who also represents Jackson Heights and East Elmhurst, about similar voter confusion issues in the neighborhood, the BOE characterized the changes as a response to redistricting, but also as the result of efforts to comply with state election law. "[T]he Board has increased efforts to make the polling sites fully accessible for senior citizens and disabled voters," the response reads. "In some cases, polling places have been relocated to more accessible buildings within the same Election District." Peralta spokesman Frank Sobrino said It was not immediately clear why the BOE chose to ratchet up enforcement of the ADA law this year. "Whatever they did, they were able to accommodate whoever went to vote there" previously, Sobrino said. 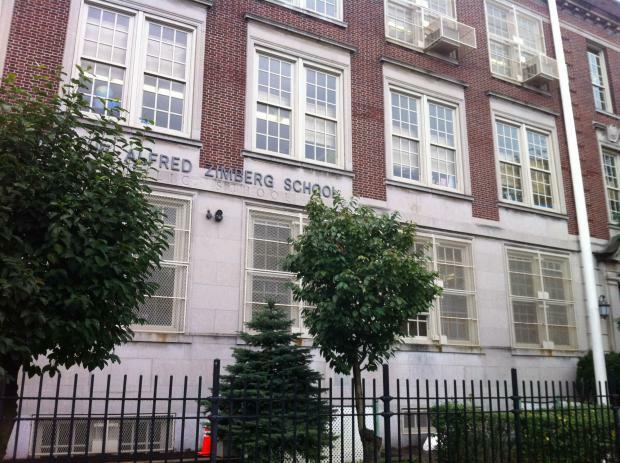 On Tuesday, questions about the swap were met with confusion by school representatives at P.S. 2, many of whom were unaware that their school would not be used as a polling site this year. Simotas' office said it believes the lack of ADA compliance lies inside the building, making it difficult for people who use the ramp to access the gymnasium, where voting would take place. Throughout the neighborhood, residents were either unaware of — or annoyed by — the new wrinkle. Dawn Finger, 53, has lived in the area since 1988 and has been voting at P.S. 2 since moving there. The change took her by surprise, and when she asked her neighbors what they thought of the switch, few knew what she was talking about. "Nobody else saw it, nobody noticed it, nobody knew about it," Finger said. "A lot of people are going to go there and say, 'What's going on?'" The concern now is whether those who had been voting in the old locations will be able to identify their new polling station, Sobrino said. "We're taking it as a done deal," Sobrino said. "At this point, we just want them to accommodate folks to avoid confusion on Election Day."